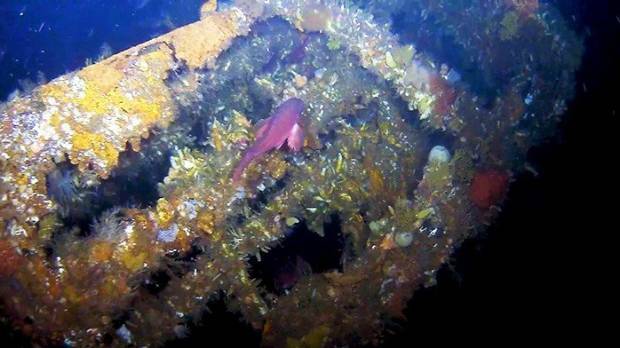 Scientists have discovered part of the stern section that was blown off a US Navy destroyer during World War II in Alaska’s Aleutian Islands. It’s been nearly 75 years since the USS Abner Read hit a mine left by the Japanese after a bloody battle. It was August 18 in 1943. The Japanese had just evacuated the island but left behind a minefield, thought to be 2000 yards (1.8 kilometres) away. But at 1.50am, as the darkened destroyer crept along at 5 knots, its stern erupted in a huge geyser of water. It had struck a mine, which snapped off a large section of the stern, sending the piece and its five-inch gun to the bottom with as many as 70 men trapped inside. On Wednesday, maritime scientists announced they had found the sunken stern and its big gun, encrusted with sea growth, in 290 feet (88m) of water amid one of World War II’s most untouched battlefields. The bulk of the Abner Read remained afloat that night. It was later repaired and sent back to the battle. In 1944, the ship was hit again, this time by a Japanese suicide plane, and sank off the Philippine island of Samar. The story of the Abner Read, which was named for a Civil War Navy hero, begins at Kiska, where it had been dispatched after its commissioning in 1943. And there, 75 years later, on July 17, underwater archaeologists found the 75-foot (22.8m) section of the stern, where scores of men probably remain entombed. The expedition was funded by the National Oceanic and Atmospheric Administration (NOAA) and run by Project Recover, a partnership of the University of Delaware, the Scripps Institution of Oceanography at the University of California San Diego, and the BentProp Project. Its aim was to study the almost untouched underwater battlefield of the World War II fight between the United States and Japan for the Aleutian Islands. It was the only World War II battle on North American soil, according to NOAA. And Kiska and nearby Attu Island are the only US territories to be occupied by foreign forces in the last 200 years, the agency said. Kiska is about 1000 miles (1609km) off Alaska’s western coast in the Bering Sea. The Japanese seized Kiska in June 1942 and weren’t driven off until July 1943, after relentless shelling and bombing by US forces. Along with the Abner Read’s stern, a dozen Japanese ships, two Japanese submarines and numerous downed American airplanes are believed to be in the local waters, according to Mark Moline of the University of Delaware. And that, in part, was what drew Project Recover, which focuses mostly on locating World War II aircraft lost at sea, said Andrew Pietruszka of the Scripps Institution, Project Recover’s lead archaeologist. The project’s attention was first drawn to a downed B-24 bomber near Kiska, but it expanded after the team learned about the Abner Read, he said Tuesday (local time) in a telephone interview. “We wanted to tell that story,” he said. The project got a US$600,000 grant from NOAA and spent two weeks with a research vessel at Kiska in July. Seaman first class Daryl Weathers, 19, a doctor’s son from Los Angeles in the US, was in the radar room on the bridge, standing the midwatch – midnight to 4am. “Everything was peaceful,” he said, and the exhausted skipper, Commander Thomas Burrowes, had just gone to his stateroom for a much-needed rest. Burrowes had already lost one ship, the USS O’Brien, to the Japanese the year before and was reluctant to leave the bridge. “I got a responsibility here for every one of these kids’ mothers to bring them back home again,” Weathers recalled him saying. Scores of sailors were asleep in the aft compartments. When the mine went off, “the whole ship came out of the water,” Weathers, of Seal Beach in the US state of California, said. A huge flash appeared on the radar screen. Part of the stern was all but severed, and dangled by the starboard screw shaft for a few minutes before it broke free and sank. “If you took a cigar and hit it with a baseball bat and broke off the end, that’s the way it looked,” he said. The crew went to battle stations. Weathers ran to his, an antiaircraft gun. But there was nothing to shoot at, so he started helping rescue men who had fallen into the frigid water. “It was kind of a bad thing,” he said. The sea was coated with fuel oil. Seventy-one men were lost, the Navy said. Weathers said he knew most of them. The entire crew numbered about 330. Burrowes survived and went on to a higher command. The blast had also set off the ship’s smokescreen mechanism, which was belching toxic smoke and choking survivors. The Abner Read was now powerless, and adrift near the shore. Plus, there might be other mines in the area. Another destroyer managed to tow the ship out of danger. The vessel was later towed to Bremerton in the US state of Washington, where it got a new stern and was returned to the war. On November 1, 1944, the Abner Read was struck by the suicide plane and sank in about 30 minutes. All but 20 members of the crew were rescued. Weathers was burned but survived, in part because a shipmate gave him his life jacket. The multi-beam sonar scans of the flat sea floor west of Kiska on July 17 had quickly picked up an object. Pietruszka and the other scientists aboard the research ship Norseman II spotted it right away. This had to be it. They sent down an underwater robot with cameras, and there, looming out of the dim light, was the encrusted profile of the Abner Read’s sunken five-inch gun. But things soon got quiet.